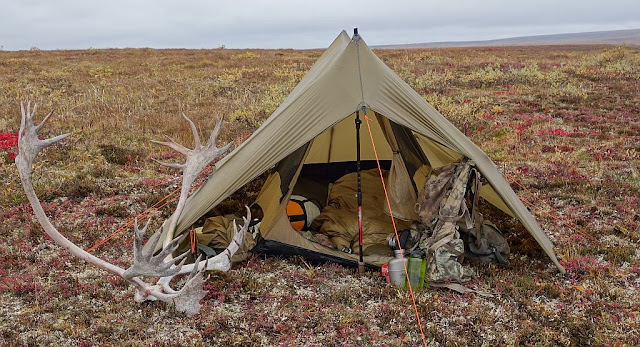 Two tags punched and all the caribou meat back in camp, hanging in breathable bags in the willows, there was a sense of ease and accomplishment. The hunts were relived as the evening stretched on and eventually we all turned in. Our fifth day on the tundra dawned with fog in the mountains but generally good conditions. Having tagged out we made the decision to call for pick up at the air taxis earliest opportunity. 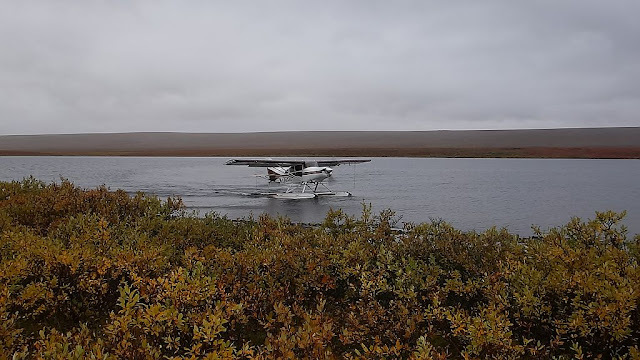 Our plan was to get back to the air taxi's base and camp there, getting an early start on the Haul road return trip and camp on the way back to Fairbanks. We wanted trees and wood and a campfire! None of which is readily available on the tundra. Our taxi service said they'd get us out that day, to bust camp but leave the tents up. Based on that conversation we thought we'd be getting out of the field, we packed up and waited. 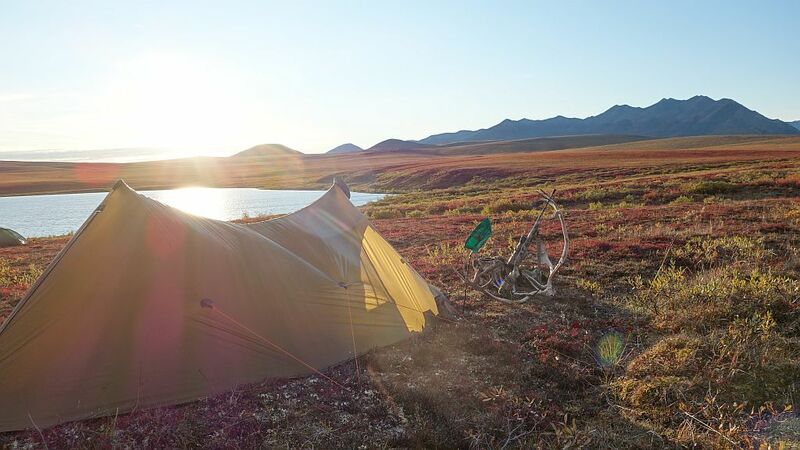 We called several other times but the weather where the outfitter was had apparently deteriorated and the last communication we received was to call back at about 9 the next morning. 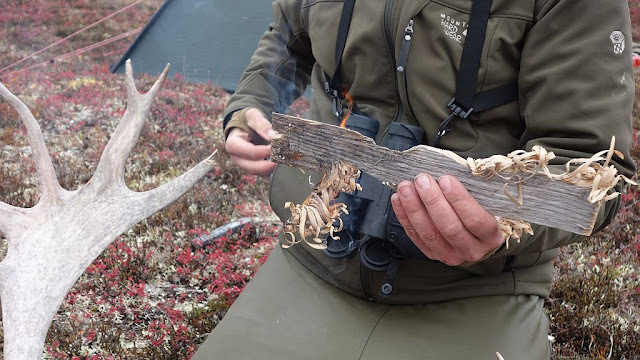 So we got camp back in order and spent some time loafing and piddling with what wood we could find which was really nothing more than ancient crate lumber from years ago. Dustin was using a Gossman WSK that was a part of a passaround. Beast of a knife. I re-pitched my Kifaru Megatarp further down the hill and did not put the 1.5 net tent back up. Bugs had been minimal to nothing due to the colder temperatures so I didn't need it. 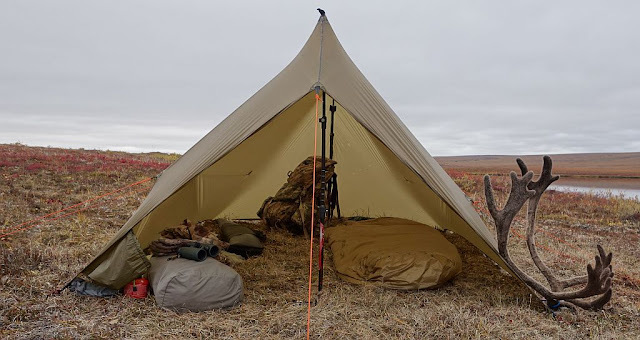 The amount of space in this shelter is truly amazing, coupled with the easy set up and simplicity of two trekking poles it has become a favorite backcountry shelter when you want more than a simple flat tarp set up provides. Even with the Bear Paw 1.5 Net Tent set up inside the mega tarp there is still gobs of space, both living area as well as storage area. My 1.5 has both the front and rear walls done up in silnylon with 10" of it along the sides up from the bottom. Even when the wind turned and blew directly into the Megatarp I barely felt it while I had the 1.5 zipped up in front. Here's a pic of the set up when the wind had changed and blew directly in. Image below provides an idea of how much space is available with the 1.5 installed inside the Mega, there's another 20sf of space that you cannot see that is at the rear, enclosed area. I'm going to have another 1.5 built with doors in either end that will allow me easy access to that enclosed space at the rear of the Mega. Without a doubt it is one of the best if not the best shelter combinations that I've ever used. With our belief that there would be no pick up we decided to have some caribou cutlets for dinner. I used my ulu and sliced us off four thin pieces of some of the finest looking meat I'd ever seen. Using some of the old crate lumber we set up a wind break and a cooking station for two pocket rockets, one for the meat and the other for a pot of mash potatoes. Dustin (From the History Channel's 'Alone' show on the left. I was amazed at how quickly the meat was cooking in my Alpine Fry-Bake pan. I originally purchased this pan back in late December or early January and have had several chances to use it. From baking bread to cooking meat to frying fish it has performed very well. I've even gone to cooking my Mountain House meals in this pan because I use my own proportions instead of the individual packs. 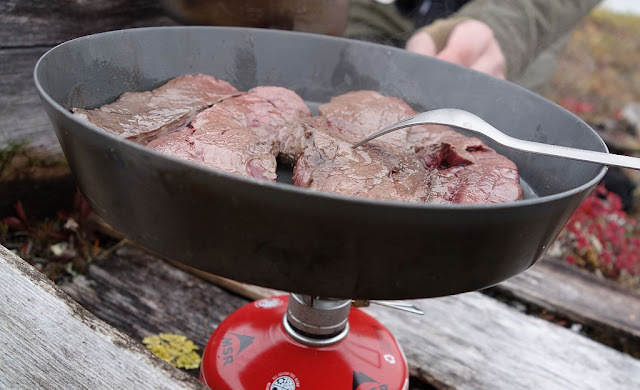 I pour in the amount I need, then the hot water, place the pan with the lid on it over my flat top kettle and cover with a camp bag or other article of clothing. This keeps the heat in and the MH meals cook just fine. 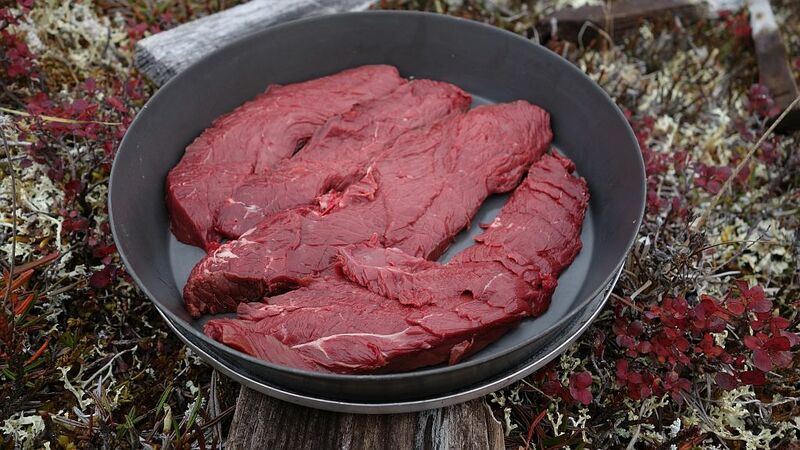 In this case the caribou meat cooked evenly and perfectly in the pan with just a small amount of oil. Coming into the home stretch we doled out the meat and potatoes. 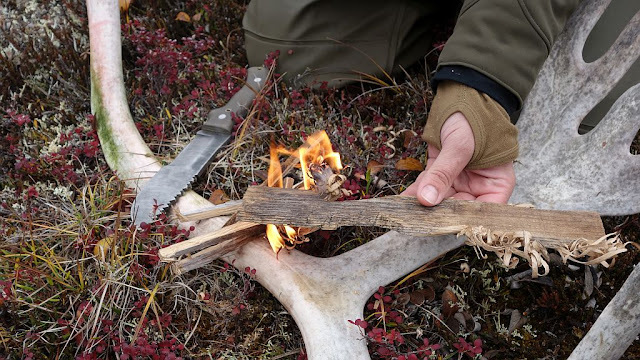 Having spent the time to prepare this incredible looking and smelling meal, we were about to have our first bite when noise drew my attention to the far end of the lake, a flicker of white gliding in, it took me several seconds to understand what I was seeing. My mind a fog of food anticipation, my critical thinking crippled by the smell of the cooked caribou. Then recognition. I said "You've got to be f*&$ing kidding me!" as the float plane glided into the lake. We sat there somewhat dumb struck for a few moments. The door on the float plane open and the voice of our bushpilot could be heard all the way in camp, "Hurry up!" was what got to my ears. Suddenly with all three of us cursing beneath our breath and maybe a few above, we ate quickly as we exploded into motion to break down our gear. We were so enthralled with the meal and looking forward to taking our time it was a shame to have to eat it on the fly, but we did, and it was damn good! I'm a bit confused by one thing: wasn't one of the tags still u filled? Why leave when one of you hadn't killed their caribou yet? 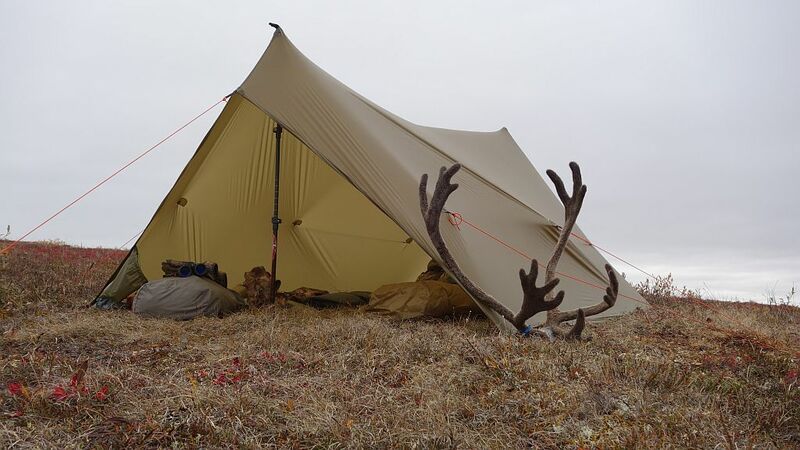 Our third man was Dustin who did not have a Caribou tag for this trip. 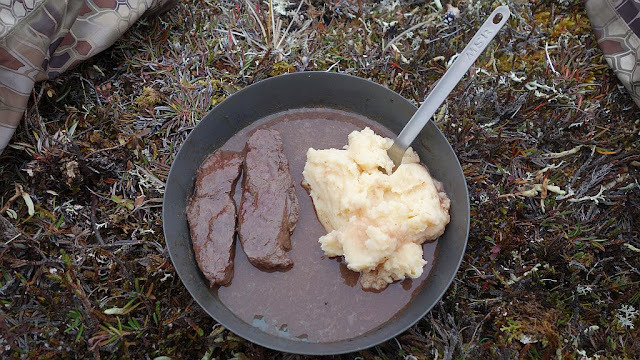 He had post trip travel that would have made meat handling impossible so he did not go after caribou.